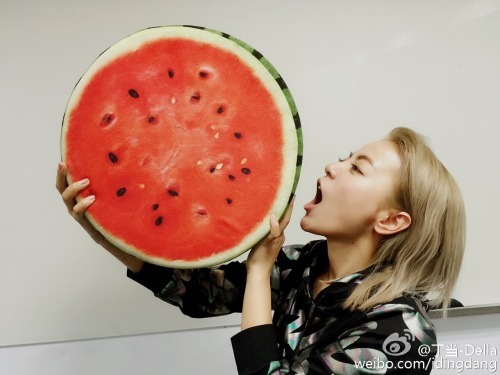 As if to prove this point, singer Della Ding poses here with an enormous watermelon. Her latest musical release was from last month, an album titled Be My Own My Friend (当我的好朋友) and that contains the opening and ending themes to Yun Zhong Ge (大汉情缘之云中歌). 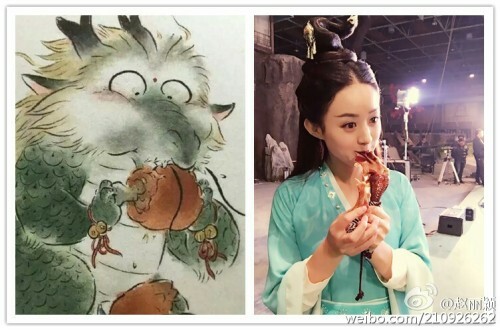 Yang Yang and Crystal Liu Yifei finished filming for the movie, Three Lives, Three Worlds, Ten Miles of Peach Blossoms (三生三世，十里桃花), also known as “someone find a more concise English title for this ASAP.” The movie is slated for release in 2017, the same year as a TV series starring Yang Mi and based off the same book is expected to air. Yang Yang: Hello, is this the police? We have someone here who’s killed a youth*. * The term sha qing (杀青) refers to wrapping up filming for a movie or drama, but literally, it can be translated as “to kill” (sha) and “youth” (qing). Hence, Yang Yang’s joke. 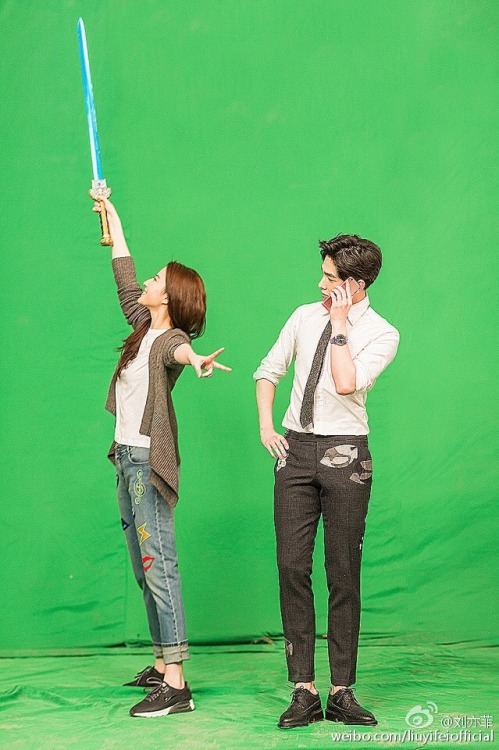 Doesn’t help that Liu Yifei’s waving around a dangerous-looking sword. 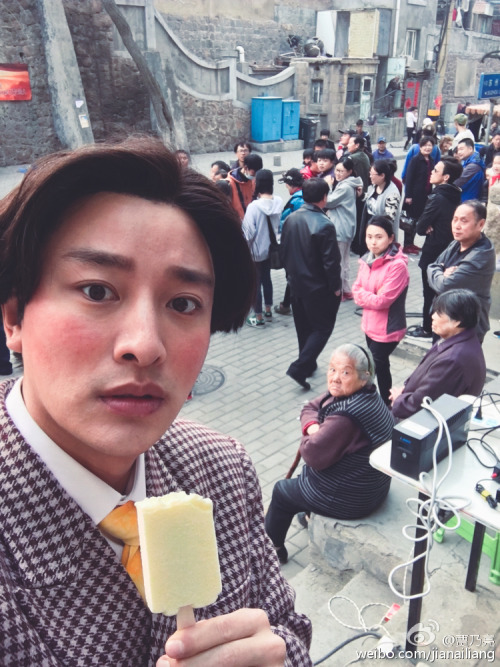 Hong Kong actor Max Zhang, who won a Hong Kong Film Award Best Supporting Actor award in 2014 for his performance in The Grandmaster (一代宗師), showed us his humble beginnings as an actor. 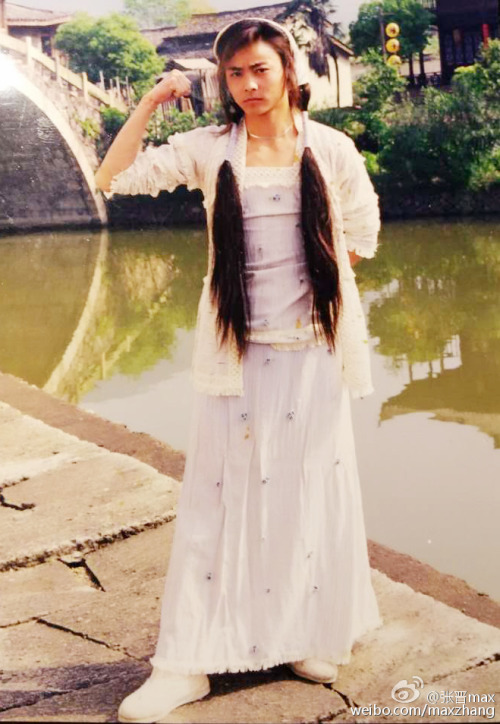 If I’m not mistaken, this was from Legend of Dagger Li (小李飞刀), way back in 1999. At that time, I was the stunt double for an actress. Do you have anything to say? Remember fighting with your family members over who gets the TV remote? Well, technology has changed, and so has the fights. Here we have Tian Liang and his son, Tian Xinchen, fighting over who gets the iPad. Former F4 member Ken Chu and actress Vivien Han (Han Wenwen) are married! The two met while filming Flower of the Woman, Like a Dream (女人花似梦), which should air this year, and began dating in June 2015. Ken proposed during her birthday celebration on April 10, and they registered their marriage on April 12. Apart from a simple celebratory dinner with family and close friends, the newlyweds also plan to hold wedding banquets in Taiwan and Beijing. Ken shared that he definitely plans to invite his fellow F4 members, but whether they come or not depends on their work schedules. This year happens to be 15 years after F4 debuted in Taiwan. The dust has settled…? The story has just begun! Jia Nailiang shared an embarrassing story about how he was mistaken for the father of his wife, Li Xiaolu. The actor, who turned 32 on April 12, has a movie, When We Were Young (不朽的时光), releasing on April 15, and a drama, Magical Space-Time (奇妙的时光之旅), coming out on April 20. And no photo for this last update, since it’s just heard through the grapevine, but rumor is that Yuan Hong and Zhang Xinyi are planning to hold their wedding ceremony on May 30. The location is said to be a castle in Germany, and only about 30 friends will be invited. In the meantime, feel free to check out their two dramas together, Princess Jieyou (解忧公主) and Through the Mystery (穿越谜团). This entry was posted in Miscellaneous and tagged Crystal Liu Yifei, Della Ding, Jia Nailiang, Ken Zhu, Magical Space-Time, Max Zhang, Three, Tian Liang, Tian Xinchen, Vivien Han, Weibo Wednesday, Yang Yang, Yuan Hong, Zhang Xinyi, Zhao Liying by Jo. Bookmark the permalink. Whew, with Ken’s marriage, Jerry is the last of F4 who is still single!